Starring Albert Finney, James Coburn, Susan Dey, Leigh Taylor Young, Dorian Harewood, Tim Rossovich, Terry Kiser, Darryl Hickman, Terri Welles. Directed by Michael Crichton. (1981/93 min). For a guy who spent a good part of his career writing about the terrors of technology, the late Michael Crichton sure as hell benefited from it. His name is still most-associated with Jurassic Park, one of the most technically groundbreaking films of all time. The first film with completely convincing CGI, movies would never be the same afterwards. Ironically, Crichton himself once directed a film about CGI before anybody even knew what it was. Of course, with Crichton at the helm, CGI is used for nefarious purposes. 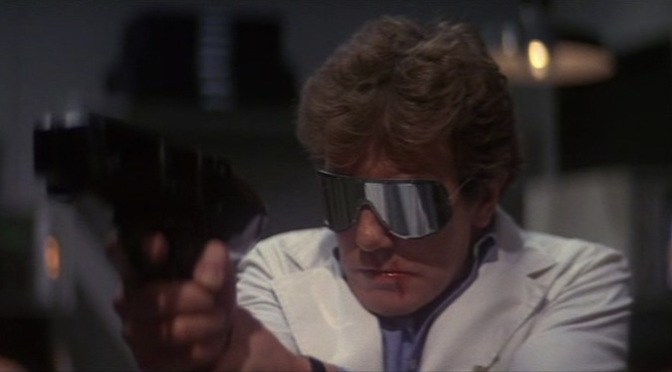 In 1981's Looker, Albert Finney plays Dr. Roberts, a plastic surgeon whose supermodel clients are being murdered one by one. He's a suspect at first, but that plotline essentially goes nowhere. Committed to protecting the last model still alive, Cindy (Susan Dey), Roberts discovers that Digital Matrix, a tech company owned by John Reston (James Coburn), is recreating computer-versions of these models for commercials designed to hypnotize viewers into submission, then killing the girls afterwards. Directing his own screenplay, Crichton doesn't adequately explain why murdering the models is necessary for Reston's to achieve his agenda. In fact, it almost feels like a plot hole (though a deleted scene - included on this disc - offers a relatively simplistic explanation). Elsewhere, Looker is both conceptually intriguing and supremely silly. Though the film is obviously a product of its time, Crichton's prophetic ideas - and warnings - are probably more relevant in today's era of CG enhancement and photoshopping than they were back in 1981. On the other hand, some plot elements border on ridiculous, such as a prototype gun that uses light to disrupt the victim's perception of time. This leads to a few scenes that elicit chuckles, such as when Robert gets the crap beat out of him by Reston's henchman (NFL star Tim Rossovich, looking like he's having a good time), who uses the weapon to appear invisible. The film isn't helped by bland performances. Finney looks uncomfortable as an action hero, to say nothing of the romantic subplot between his character and Dey's. Even Coburn appears to be going through the motions. Michael Crichton always had a knack for exploring the dark side of technology, though with the exception of the original Westworld, he did it more effectively as a novelist than a director. But while Looker is far from a forgotten classic, much of the technology that Crichton predicted has-since become reality. It's always interesting to revisit old films where the sci-fi tag may no longer apply. INTRODUCTION BY MICHAEL CRICHTON - More like a retrospective interview with the director. IT'S NO WESTWORLD, BUT NOT BAD.